Make Easter morning extra magical as your little one embarks on an eggs-traordinary egg-hiding adventure all around the world! As fun and festive as going on an egg hunt, An Easter Surprise gives your child the chance to plan his or her very own Easter mission! 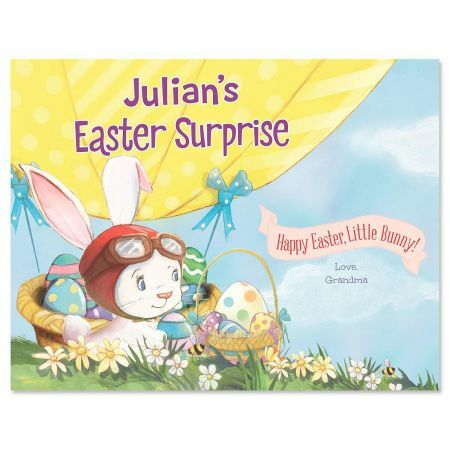 Soar as high as the moon in a hot air balloon, deliver eggs all over town, and stash tasty treats all down the streets — your little one will be thrilled at the surprise twist in this Easter adventure! Personalize this exciting Easter storybook with your child's name and hometown, along with a special message on the dedication page. A sweet Easter surprise your little one will cherish long after the holiday is over! Hardcover; 32 pages. 8-1/2 x 11”. Ages 2 to 11.